For those of you who are new(er) followers, I started a series awhile back while reading Nina Garcia's The One Hundred: A Guide to the Pieces Every Stylish Woman Must Own, and am just getting back to it. You can see the A's here, the B's here, and the C's here. Follow along and see how many of the 100 pieces you have! I've decided to take a new approach to these posts now that I've found Polyvore, and I am still a little unsure how to proceed in the future. Multiple letters at once? Continue individual letters? What is one fashion trend that keeps coming back, decade after decade? The denim jacket. Starting with Danny Zuko and the other Greasers in the 50's, the denim jacket has been a large part of the fashion industry. The hippies in the 60's and 70's, led by Janis Joplin to the 80's punk rock and bedazzling kept the tradition alive. My generation remembers the 90's version made popular by Ralph Lauren, pairing it with prairie skirts, cowboy boots and turquoise. Although I've had a denim jacket as long as I can remember, I cannot find one picture of me wearing it! It's a Gap denim jacket, very traditional, similar to the one all at the right above. I wear it mostly over sun dresses and paired with a cotton t-shirt and a maxi skirt. Be extreme. It should either be really dark or really worn out. Buy it a size too small or find a really fitted model. In general, don't wear it with another piece of blue denim. The jean tuxedo is strictly for the cowboys. Who actually rodeo and herd cattle. But a blue jean jacket with white jeans is a definite yes! Every jean maker should have a version, but a few great sources include Levis, A.P.C., Diesel, Marc by Marc Jacobs. And of course, the vintage shops. I had to laugh reading Nina's description, "best when large, real, and received as a gift. But large, fake, and self-purchased do the job, too (if you lose one, you won't want to kill yourself.)" Perfect for an everyday earring, I can't think of any outfit a diamond stud doesn't go with. Jeans, workout attire, formal, you name it, a simple sparkle in your ear is classic. 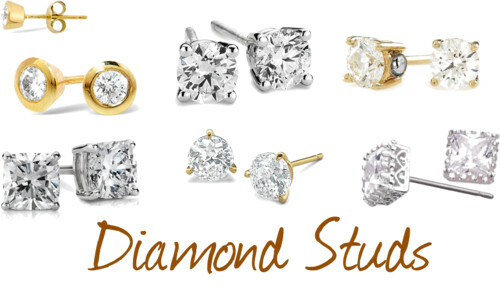 What I would recommend is investing in a higher quality Cubic Zirconia pair or a pair of Moissanite studs. For around $150, you can pick up a pair of cubic zirconia studs at Macy's set in 14k gold that sparkle better than their diamonds. I speak from experience, I spent 5 years selling fine jewelry for Strawbridge's, a department store in the North East that was bought and closed by Macy's. I remember receiving training on cubic zirconias, with Russian Cubic zirconias being the higher quality. Yes, you may be skeptical about the grades of cubic zirconias, but next time you're in a department store, compare something from fashion jewelry to the CZ's in the fine jewelry department set in 14k gold, you'll see the obvious difference. Moissanite is another option as a substitute for diamonds, but much pricier than cubic zirconias. What the Russian CZ 2cttw. studs set in 14kt can offer you for $150 will cost you close to $700 in moissanite. First patented in 1963 by Gianni Mostile, the driving shoe was designed with the rubber soles for traction while driving. Style icons such as JFK and Roberto Rossellini began wearing these shoes more as street shoes than driving shoes, starting a trend. Similar to the loafer with the exception of the sole, the driving shoe pretty much epitomizes a "WASP-chic" outfit, doesn't it? The only person I know who owns a pair of these is a woman named Linda I used to work with who had them in every color and every brand. She was an older woman, and said they were the most comfortable option for standing long hours working in retail. To be indulgent, get them in butterscotch suede. They look amazing with tan legs. Remember, they look better aged. Although this book is designed to be a guideline to the 100 essential timeless pieces for your wardrobe, it doesn't have to be for everyone. Case and point, these shoes. I do like the ones at the right, but would I wear them? Doubt it. So, how many of the D's do you have?